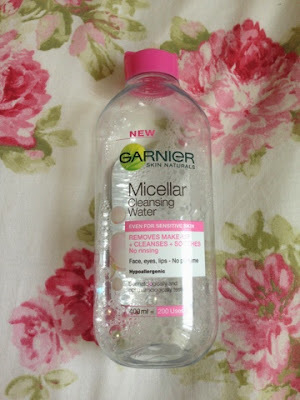 The first product I'm going to talk about is the Garnier micellar water which retails around the £4 mark. After reading many reviews a while ago, I picked it up and haven't used anything else but this in the past six months to remove my makeup. It works a dream, easily wiping of the makeup and is gentle on the skin. It can even take off eye makeup and as its got no perfume in, its ideal for sensitive skin. I just love it and would recommend it to anyone who wants a makeup remover that does the job and is very inexpensive. 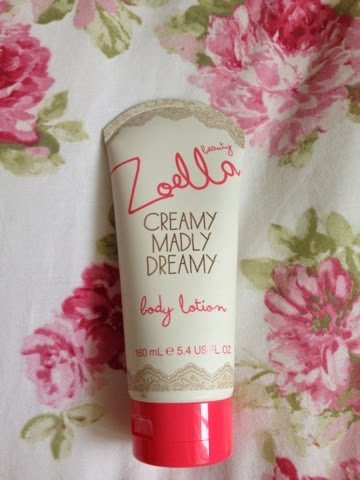 The next product is another skincare one and from Zoe's beauty range, the 'Creamy, madly, dreamy' body lotion. I usually like to use this after the shower to moisturise my skin. I wasn't too sure about it at first because the lotion took a long time to work into the skin, however once it sunk in, my skin felt really soft and smooth. The lotion has a lovely fresh, relaxing scent so it doesn't feel like you're applying something that's heavily perfumed. It costs only £5 and as the tube is quite big, I reckon it'll last me for a good while! Another product is Collection's lasting perfection concealer. This product has been hyped about in the blogging/youtube community for a good while now and if I'm honest I don't think I've ever tried another concealer besides this one because its always done the job for me and is rather cheap to buy. 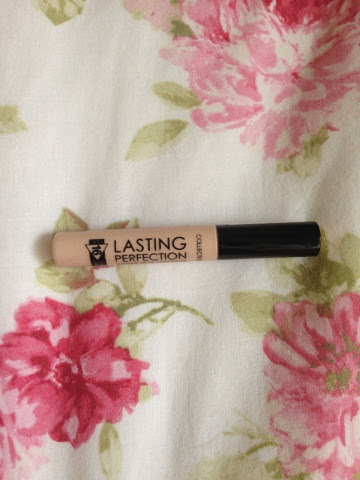 This concealer helps hide my under eye circles and blemishes and ahh I just love it! I've gone through quite a few tubes over the past few years, however one of these can last for a long amount of time! A definite recommend and costs around the £4 mark. 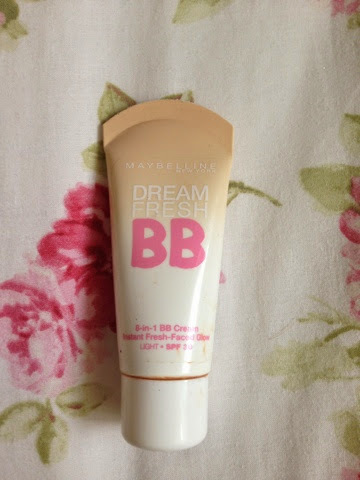 The Maybelline BB cream, is another face product which I am completely obsessed with! 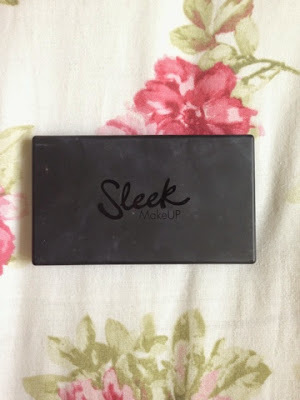 I use this on an everyday basis because its very light on my skin and gives this lovely glow with a small amount of coverage, perfect just to give your skin a bit of an oomph. I find its very easy to apply and can be with either fingers or a brush. As its a light coverage, I'd say its ideal for makeup beginners because then they'll know if they would want more coverage or liked this lightness of this on their skin. Even though the tube looks quite small, its lasts for a good while as you only need a little amount for the whole face. Retailing at £7.99, its affordable and can work for many looks. Onto a lip product now, are the Tanya Burr lip glosses. I love her lip gloss range and I have two which are 'picnic in the park' and 'chic'. Tanya has a lovely range of different colours and cost £6.99 each. 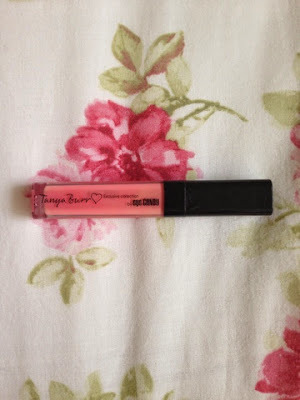 These lip glosses glide on so easily, give the most beautiful finish and last for a fair amount of time, I'd say a few hours which in my opinion is good for a lip gloss. They have great pigmentation and are very moisturising on the lips, which its amazing to find in a lip gloss. I've still haven't got round to buying anymore colours, but I'm sure I will towards the spring/summer time. Another makeup item is the Sleek faceform kit in light. With a 3 in 1 kit containing a bronzer, blush and highlighter its the perfect trio to pop into your handbag! 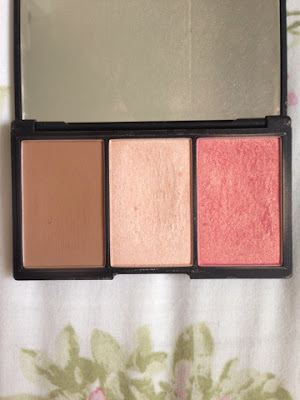 I adore this palette, the bronzer is a lovely matte brown shade which easily contours the face and the highlighter and blush have the most beautiful shimmer. All 3 products have amazing pigmentation and when all put together give a lovely look on the skin. I also love how it has a huge mirror, so if you bring this on the go, it saves you bringing a separate mirror. With it costing £9.99 it comes just under £10, but with 3 products in 1 I say its a complete bargain. Onto eyes, MUA palettes are a must, I just love them! 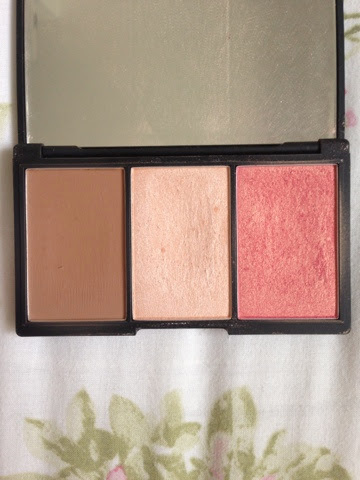 I have 3 of their palettes, two neutral ones and a night out one, the picture below is the MUA undress me too which you can see has had a lot of love. All of the palettes have beautiful pigmentation with a variety of different colours, some matte and some shimmer. MUA undress me too has very creamy light shades and includes a few darker shades like the black, giving you the chance to experiment with day and night looks. For £4 they are a complete bargain and ideal to experiment with makeup. 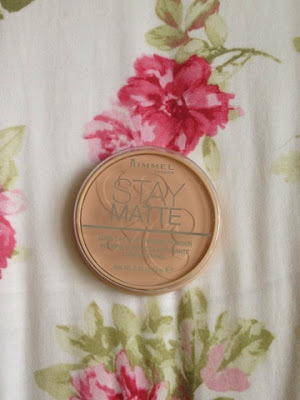 The Rimmel 'Stay matte' powder is another very hyped about product. It easily gets rid of shine and helps set the makeup all day. I think it costs around £4 and is an essential in your makeup bag in my opinion. 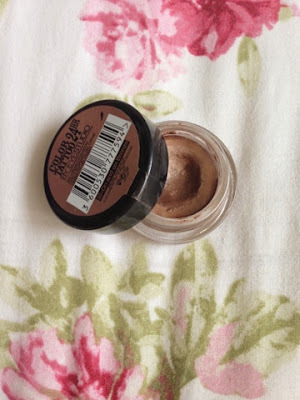 Another eye product would be the Maybelline colour tattoo in 'On and on bronze'. As you can tell by the huge dent I have a big love for it. I use it as part of my everyday makeup under eye shadows. 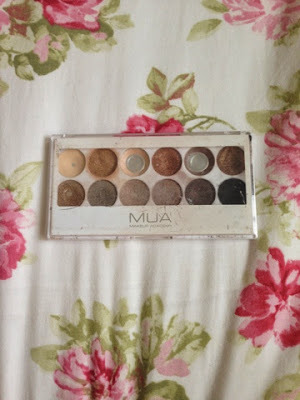 It has the prettiest bronze shimmer colour which helps give the nicest neutral eye. I have a couple of these colour tattoos, they are really easily to apply, have a good pigmentation and help the eye shadow last all day as well as giving an extra oomph of shimmer. 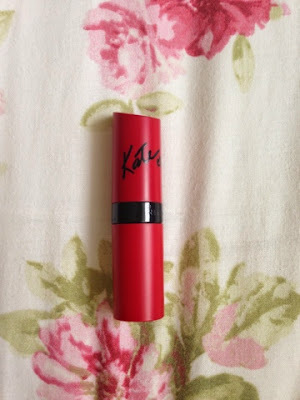 My last top ten product is the Kate Moss range of Rimmel lipsticks. The one pictured below is in the shade 107. I have two of these, the other being shade 01 and they have been my go to lipstick this autumn/winter. Both of which give the nicest colour pigmentation, lasting power and are very moistorising on the lips. I usually find some lipsticks can be quite drying but not these, they have the same kind of feel as a lip balm, very soft and silky on the lips. Also they are very easy to apply and give a beautiful matte finish. For the price of around £5/6, they are my favourite lipsticks I've tried and I can't wait to get my hands on more. I hope you enjoyed my top ten beauty products for under £10! I love this BB Cream as well! I have been wearing it for a couple years now and I have yet to find another BB Cream that works as nicely. I also have the same bronze tattoo eye shadow, and while it's still fairly new I did open it up last week to put some on and it was too dried up to use, which was rather disappointing. I guess I didn't put the cap on tightly enough in my previous use! I love Kate Moss' lipstick line, they last forever!